This is Julia’s last known location. Do not go there now. Go to notifica.us/alert first. If you’ve received a Notifica alert, go to the resources page. Use Notifica to plan, learn and act if you are at risk of being detained by deportation agents. By pressing one button, Notifica will send your alert simultaneously to people you trust and community groups who can support you. By sharing your location you’re making it easier for your Defense Network to defend you. Notifica will access your location data only when you send an alert. Notifica clears all the app data when you send an alert and uses some of the strongest encryption available to keep your data private. 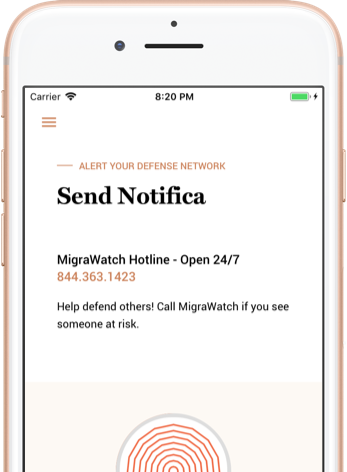 Send intro texts and resources for your Defense Network, check your preparedness level and know your rights—all within the app! When to use the Notifica button? Press the button to send the alerts. Your entire Defense Network will be notified that you may be at risk and all the app data will be cleared to protect your privacy. 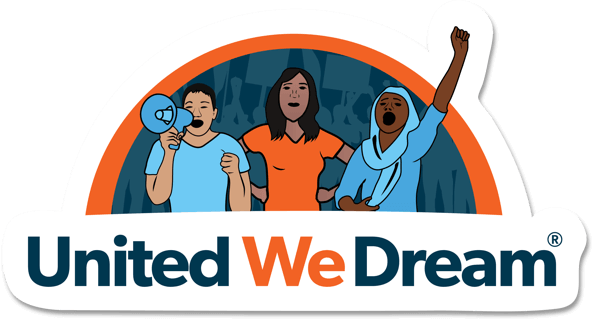 United We Dream is the largest immigrant youth-led network in the country. With over half a million members, the network advocates for the justice and dignity for all immigrants. Notifica was made thanks to the knowledge of immigrant youth organizing, and a generous partnership with Huge and Matter Supply, full-service design/digital agencies. If you see deportation agents or someone at risk, please report it to the MigraWatch Hotline at 1-844-363-1423 (Open 24/7). This app helps me to know my children will be watched after if I am ever detained. I can just send an alert and my cousins help them. Notifica allows [our] community to create emergency plans that are easy to execute — even when facing the scariest of circumstances. Notifica lets immigrants set up PIN-protected text messages that are sent to friends, family and lawyers in case of emergency. Notifica is Amazing! With the uncertainties that immigrants live in the United States now, Notifica delivers a way for people who might be in danger to connect and protect each other. I think this is awesome! Love seeing technology used for good. Great app serves as great network to let loved ones know and other resources know about your whereabouts. Todo migrante y toda persona dedicada a proteger comunidades migrantes debe descargar este App! * Standard messaging rates may apply. 2018 United We Dream, All rights reserved.